At the beginning of November 2018, The Waltham Forest Guardian’s Alice Richardson reported that at a full Council meeting in 2015, the Labour Cabinet portfolio holder, Cllr. Liaquat Ali, had failed to declare an interest. ‘On the council’s website, Cllr Liaquat Ali, who is a private landlord, is recorded as being present in a full council meeting on July 9, 2015 where private rental licences were discussed, but there is no record of him declaring an interest during the meeting. The council’s list of interests declared at meetings shows that fellow cabinet member for health, Cllr Naheed Asghar, did declare an interest on the day, as her partner owns a lettings company. Cllr Asghar withdrew from the meeting while the private rental licensing item was discussed. No such record of interests declared at the meeting or withdrawing from discussions exists for Cllr Ali’. Since Ms. Richardson’s facts are unimpeachable (and can be checked via the LBWF website, here https://democracy.walthamforest.gov.uk/ieListDocuments.aspx?CId=335&MId=3903&Ver=4) this blog then put the matter before LBWF Director of Governance and Law, Mark Hynes, and asked him to investigate. ‘You have now formally requested an investigation into Cllr Ali’s participation at the Council meeting held in 2015. My view is that I see little merit in such an investigation given the meeting took place over three years ago. I have already spoken with Cllr Ali who cannot recollect whether he was advised of the need to declare any interests at the Council meeting back in 2015 but clearly had there been any concerns at the time then these would have been properly dealt with by my predecessor. In my view what we need to show is that matters are being properly dealt with now. Cllr Ali’s Register of Interest remains accurate and up to date…As a matter of record we do not have the Register of Interests that existed in 2015, and given I was not the MO at the time I see little point in pursuing an investigation of an historical event that dates back over 3 years. Even if it were shown that an interest should have been declared the sanctions are limited – there is no power to disqualify or suspend a member, and no criminal offence given there was no deliberate omission or wilful disregard on the part of Cllr Ali.I can confirm that these mattes [sic] have been discussed with the Council’s Statutory Independent person’. Scrutinising Mr. Hynes’ reasoning step by step reveals five significant areas of concern. 1. ‘we do not have the Register of Interests that existed in 2015’. So while Mr. Hynes may not be able to access ‘the Register of Interests that existed in 2015’, he has always had at hand another way of ascertaining the situation as it pertained in that year, and thus has no excuse for ignorance about Cllr. Ali’s occupation at the time of the 9 July council meeting. 2. ‘Cllr. Ali…cannot recollect whether he was advised of the need to declare any interests at the Council meeting back in 2015’. ‘every Member has a duty to: register their pecuniary and non-pecuniary interests; Declare [sic] their interests at meetings; and Where [sic] a pecuniary interest is declared in respect of an agenda item or items at a meeting, to withdraw and not participate or vote in that item or items’. This is unambiguous guidance, and Cllr. Ali, like all other elected representatives, could have been in no doubt at all as to the correct course of action. Thus, the availability, or not, of advice is irrelevant. 3. ‘there was no deliberate omission or wilful disregard on the part of Cllr Ali’. In his judgement, Mr. Hynes could have said that he was agnostic about why Cllr. Ali failed to follow established procedure, but in fact he goes much further than that, and positively rules out two possible explanations. Asked for the evidence that persuaded him to reach his conclusions, Mr. Hynes cites ‘discussions I had with Cllr Ali and also the independent person’. It is certainly germane in assessing Cllr. Ali’s behaviour at the council meeting in question that at the time he was a very senior figure in Waltham Forest Town Hall; and that, as has been established, one of his junior peers respected the code of conduct for members without demure. It is also germane that Cllr. Ali is quite open about the fact that his memory of events in 2015 is in some respects hazy. Yet it seems that, in assessing culpability, Mr. Hynes simply set these matters aside. 4. ‘My view is that I see little merit in such an investigation given the meeting took place over three years ago’. The members’ code of conduct does not include any statute of limitation. Cllr. Ali remains a leading figure in the administration. So why Mr. Hynes believes that a three-year gap is of any great significance remains a mystery. 5. ‘Even if it were shown that an interest should have been declared the sanctions are limited’. The difference in tone is certainly both striking and perplexing. 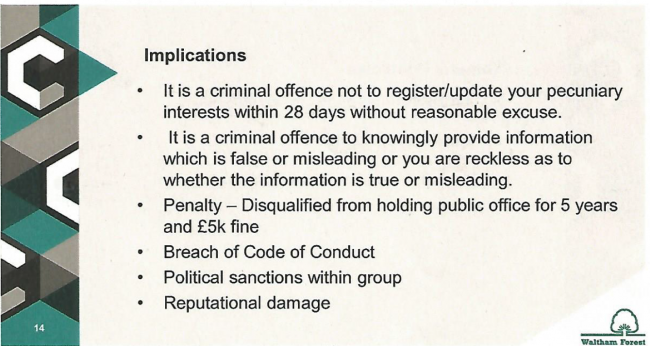 It is also noticeable that in his discussion of what constitutes criminality, Mr. Hynes here makes no reference to a councillor displaying ‘wilful disregard’, and instead advises that an offence may occur if a councillor is ‘reckless’ about whether information is ‘true or misleading’. Perhaps he believes that ‘wilful’ and ‘reckless’ carry the same meaning, but they do not. Synonyms for ‘wilful’ are ‘intentional’ and ‘deliberate’, while those for ‘reckless’ include ‘rash’, ‘careless’, ‘thoughtless’, ‘heedless’, ‘inattentive’, and ‘hasty’. Quite why Mr. Hynes uses different terminology in front of different audiences is unclear, but it casts doubt on whether he fully understands what he is arguing. And this is no trivial matter, because from the perspective of a mere resident, a senior councillor who fails to declare an interest quite reasonably might be thought to be – precisely – ‘rash’, ‘careless’ and ‘inattentive’. In conclusion, the Ali case reprises what is now becoming a long-running Punch and Judy show. A councillor is revealed to be in contravention of the rules. And then up pops Mr. Hynes to reassure us all that there is nothing to worry about, because whatever happened was an accident or innocent mistake, the councillor involved told him so – and even if it wasn’t an accident or mistake, he couldn’t do anything about it anyway. Against this background, perhaps the most obvious question to ask is: why bother to have a members’ code of conduct in the first place? A senior councillor who was present at the full council meeting in 2015 has got in touch to suggest that Cllr. Ali may legitimately not have had to declare an interest because the debate was principally about letting agents, not landlords. (b) when compiling the story, Ms. Richardson offered Cllr. Ali a chance to comment, but he ‘did not respond’. (d) when LBWF was asked under the Freedom of Information Act to ‘state the date or dates when the discussions [between Mr. Hynes and]…Cllr. Ali are purported to have taken place’, ‘forward copies of any written notes or other records of these discussions’, and ‘detail the reasons that Cllr. Ali produced to excuse his failure to declare an interest at the council meeting on July 9, 2015′, it answered ‘Waltham Forest does not hold the information requested’. Cllr. Liaquat Ali’s new Cabinet role: a square peg in a round hole?